Angela Yosten: Thimble Blossoms GIVEAWAY!!!! Camille with Thimble Blossoms is doing a GIVEAWAY on her blog! 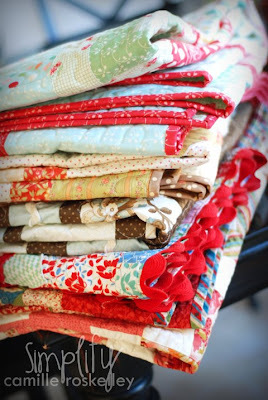 You must check this out... she is giving away a finished quilt made out of your favorite Thimble Blossoms pattern! There are several ways to earn extra points and you have to tell your strangest compliment you have ever received. How fun! It was really hard for me to choose just one favorite pattern as there are so many great patterns designed by her. She has a really great blog, too! Just tell her Moda, Home, Mom sent you!